Domestic production was higher than anticipated during Q2. This was partly due to the timing of Easter this year, which unusually straddled the first and second quarters. However, it also seems the impact of the disease challenges this winter was not quite as severe as expected. Nonetheless, production growth is still expected to moderate in Q3 in light of the relatively difficult winter. 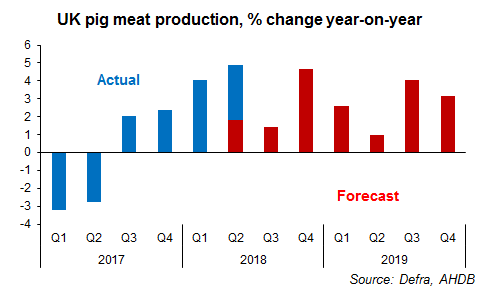 Production might now also be limited in the short-term if the current hot weather continues, reducing pig growth rates. However, by Q4, these limitations should phase out. With at least some modest breeding herd growth anticipated, strong production growth could therefore return by the end of the year. There may be some slowdown in the rate of increase moving into 2019 though, with the current weather limiting breeding herd performance. Imports dropped significantly in Q1, which was expected in light of the higher UK production at the time. However, it is more difficult to estimate Q2 volumes, as figures are only available for April and May, and show diverging trends. The gap between UK and EU pig prices widened during the second quarter, and the UK premium continues to be high by historic standards, suggesting there may have been increased pressure on pig meat imports. Meanwhile, despite a strong performance in Q1, initial estimates for Q2 exports suggest shipments slowed in the second quarter. Estimates based on the available figures for April and May indicate an 11% year-on-year decline. The Chinese market has been more difficult than anticipated, and this looks set to continue, with domestic pig prices there remaining depressed. With global supplies expected to increase this year, there is tough competition on the global pork market at the moment. In light of developments on the export market, it seems it may be challenging to achieve the export growth forecast back in April for the rest of this year. This means there are risks that supplies on the domestic market could be higher than anticipated, and currently no signs of growth in UK demand to meet this additional product. Recent Kantar Worldpanel data suggests overall pig meat demand has been broadly stable, with bacon and sausages counteracting declining fresh pork sales. If this continues, further downward pressure may be felt on pig prices, especially in the latter quarter of the year.